As cattle are fed for higher levels of production it becomes more important to define nutrient requirements in increasingly sophisticated terms. The National Research Council (NRC, 1989) has established requirements for NEL, and suggested optimal dietary guidelines for ruminally degraded organic matter for dairy cattle. Laboratory methods for directly measuring these parameters however, have not been established. Diets for dairy cattle are also routinely balanced for ruminally degraded protein (RDP) and ruminally undegraded protein (RUP). The forages fed to dairy cattle typically provides half or more of the total protein intake in high producing dairy cattle. Requirements for RUP and RDP have been established by the NRC (1989) yet there are no standard accepted procedures for routinely analyzing forages for RUP or RDP. There is a need to re-evaluate how energy and protein components of forages are analyzed and a need to develop testing procedures that can provide estimates of ruminally available energy and protein that can be used in ration formulation. Over the past three years we have been developing methods to more accurately measure the energy value and ruminal protein degradability of forages for dairy cattle. The goal of the research has been to develop rapid, inexpensive and reliable methods for analyzing forages that can be readily adapted by commercial testing laboratories. The digestibility of forages can be determined in at least four different ways. The most accurate and precise approach is by feeding trials (in vivo studies). In vivo studies are not as practical as a routine analysis because of the obvious limitations of expense, time and labor. In vivo studies are, however, the ‘gold standard’ by which alternative methods are compared. Alternative methods of estimating forage digestibility are based on: (1) empirical relationships between forage fiber and digestibility, (2) summative equations or (3) in vitro digestion of forages. Each alternative method has unique advantages and disadvantages, and more importantly, the alternative methods do not necessarily predict the same digestibility or even rank forages in the same order. Empirical approach. The energy values (TDN or NEL) reported on most forage test reports are derived from empirical equations. The underlying principals behind the empirical method is that the energy value of forages (i.e. forage quality) is a function of its digestibility and intake potential. As the concentration of forage fiber increases, intake potential and digestible energy concentration decrease. Forage digestibility is most commonly predicted from a regression equation based on ADF (DDM = 88.7 − 0.779 × ADF; Rohweder et al., 1978). Intake potential is predicted from NDF (DMI = 120 ÷ NDF). Forage intake potential and digestibility are combined and reported as Relative Feed Value (RFV). The RFV is used to rank forages according to their potential to provide energy to high producing ruminants. In dairy nutrition, the RFV cannot be used directly in ration formulation, but the digestibility values derived from the empirical equations are used to balance diets for energy. Since energy is often the most limiting nutrient for high producing animals, estimates of forage digestibility must be accurate and precise. There are two major factors that affect the accuracy and precision of the predicted energy values of forages. The first concern is how accurate and precise are the laboratory methods used to measure NDF and ADF content of forages. Most commercial labs use near infrared reflectance spectroscopy (NIRS) to predict fiber content of forages. Over the past 20 years, improvements have been made in NIRS instrumentation and calibration techniques that have significantly improved the accuracy and precision of this technique. The overall result is that the nutritive value of forages can be predicted by NIRS more rapidly and with less expense than with wet chemistry procedures. There is little question that the ADF and NDF values predicted by NIRS are as reliable as ADF and NDF values measured by wet chemistry. The second concern is how reliable are ADF or NDF as predictors of digestibility. This is a problem that affects both wet chemistry and NIRS analysis. The regression equations used to predict forage digestibility are population specific (Weis, 1994). Thus, estimating digestibility of a forage from regression equations will only produce acceptable values if the forage sample is represented by the population of forages used to generate the regression. It is well documented that factors such as environment in which the forage was grown (temperature, moisture, and light intensity), cutting number and year affect the relationship between forage fiber and digestibility. Therefore, data sets used to develop empirical equations must be carefully defined and constantly updated. Another problem is that samples sent for analyses are frequently mixes of legumes and grass that are not well defined. The precision of the energy value estimated from applying single variable regression equations in this case becomes questionable. Even under the best conditions, the correlation between fiber levels of alfalfa and grass/legume mixtures to dry matter digestibility are typically 0.8 or less (Weis, 1994). This indicates that the regression equations used to predict forage digestibility can under or overestimate the digestibility of any single forage by as much as 25 to 30%. The accuracy of estimates of TDN or NEL based on fiber analyses will continue to be the major concern if single variable regression equations are used as the reference for developing calibration equations of mixed samples in NIRS. Summative equations. An alternative approach for predicting forage digestibility is to analyze forages for energy yielding components (i.e. the protein, fat, non-structural carbohydrate and fiber) and sum the digestible parts of each component together to predict forage digestibility. This approach has been refined by an Ohio State University scientist (Weis, 1994). To calculate forage digestibility, total fiber (NDF), lignin (ADL), total protein (CP), cell wall bound protein (ADIN), fat, and ash contents of feeds are measured. Forages are analyzed for each nutrient by either wet chemistry of NIRS. Each energy yielding component of the feed (fiber, protein, fat, NCS) is then multiplied by a digestibility coefficient and the products are summed together. The summative equation’s main advantage over empirical equations is that the summative approach is population independent. Therefore, the summative method can be used to predict energy values of grass, legumes, corn silage and mixtures of forages. The disadvantages with this procedure are cost and time associated with analyzing the components. Several forage testing laboratories report forage digestibility based on the summative equation developed at the Ohio State University. Direct estimation of digestibility by a kinetic approach. A third method is to conduct in vitro assays to directly measure forage digestibility. Direct measurement of forage digestion by in vitro methods are more accurate and precise than the empirical approach (Mertens, 1993, Weis, 1998). This approach assumes that the major factors affecting forage digestion are how fast it digests and how long it is retained in the digestive tract. Forage samples are incubated in rumen fluid and the amount of forage that degrades is monitored over time. Rate and extent of forage digestion can then be estimated by plotting the disappearance of forage over time. The forage dry matter is classified into three parts according to its digestion characteristics (Figure 1): soluble-instantly digested dry matter or cell soluble (fraction A); slowly digested NDF (fraction B); and indigestible NDF (fraction C). Fraction B is also defined by its rate (kd) of degradation. The advantage of this approach over the empirical approach is that this is a direct measurement of forage digestibility. Digestibility is not predicted from fiber content. Advantages of the kinetic approach over the summative equation methods are: (1) digestion coefficients are derived from direct measurements rather than empirical coefficients and (2) forage digestibility can be adjusted to compensate for the effects of intake on forage digestibility. The major disadvantage of this approach is that it is time consuming, labor intensive, and requires more highly trained personal, equipment and facilities than the other two approaches. Although most university or industry research labs have facilities to conduct these analyses, only a few commercial labs in the United States offer in vitro analysis as a method to estimate forage digestibility. The only practical way for commercial labs to adapt this approach is to develop a NIRS procedure that will predict forage digestibility based on a database of forages that have been analyzed by the in vitro procedure. The NIRS calibration equations from this data base could then be downloaded into the NIRS units of the commercial labs. We have been working for the last three years to determine if it is feasible to directly predict the rate and extent of digestion parameters of forages by NIRS. This research involved three objectives. Determine if different methods for predicting forage digestibility result in different estimates of digestibility. If estimates of forage digestibility derived from the in vitro ‘kinetic’ approach are more accurate and precise than the currently used empirical equations, develop NIRS equations that will predict digestion kinetics. Validate the new NIRS procedure to ensure that the estimates of digestibility are accurate and the procedure is robust enough to be practical for commercial application. Comparing estimates of digestibility derived by empirical, summative or kinetic methods. The data in Table 1 demonstrates some of the potential problems with the current system of forage analysis. Hay and silage samples were collected at random from forages that were submitted to the UW Soil and Plant Analysis Laboratory at Marshfield. Each sample was analyzed in our laboratory for ADF and NDF by wet chemistry and RFV and DDM were calculated. We also directly measured dry matter digestibility of each forage by an in situ-kinetic procedure (Beyer-Neumann, 1998). 2DDM = 88.9 − (0.779 × ADF), Rohweder et al. (1978). 3In situ-kinetic procedure (Beyer-Newmann, 1978). Results of this preliminary study show that in general, as the fiber level of forages increase, the RFV declines and the digestibility estimated by either the empirical approach or the kinetic approach decline. There are several instances, however, where individual forage samples deviate substantially from the trends. The three highlighted forage samples are examples. The digestibility of these three forages were similar when measured by the kinetic approach even though they ranged in RFV from 182 to 116. Digestibility of the forage with the highest RFV (182) and the lowest ADF (24.9%) differed by 10 units when estimated by either the empirical or kinetic procedures. The RFV and empirically derived digestibility suggest that these three forages would be utilized quite differently by high producing dairy cows but the kinetic estimates of digestibility suggest that there would be little difference in utilization of these three forages by high producing dairy cows. Although this is not conclusive proof that one approach to estimating digestibility is superior to another, it is evidence that forage digestibility estimates based on a kinetic approach could be substantially different than estimates derived by the empirical approach that is routinely used by forage testing laboratories. In a second study, we collected samples (n=108) submitted to the Marshfield station for routine analysis and analyzed them in our lab for fiber (NDF, ADF, lignin), protein, fat, and ash. From the chemical analysis, we were able to estimate forage digestibility from several empirical or summative approaches. 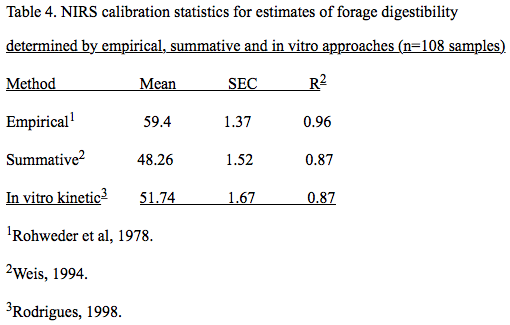 We also directly measured forage digestibility by in vitro-kinetic procedure (Rodrigues, 1998). Results, partially summarized in Table 2, suggest that on average the empirical estimates of forage digestibility were significantly different than digestibility calculated by the summative or in vitro-kinetic procedures. The summative approach and the in vitro kinetic gave similar estimates of forage digestibility. Further analysis also revealed that the empirical approaches ranked forages differently from the most digestible to the least digestible, than either the summative or in vitro-kinetic procedures. The summative and in vitro kinetic approaches ranked forages similarly. Results of this study confirm that empirical equations will give different estimates of forage digestibility than either summative or in-vitro kinetic approaches. Diets prepared by using the forage digestibility from the empirical equations are expected to produce different outcomes in terms of animal response than if available energy of forages had been predicted by in vitro kinetics of the summative equations. Calibration of the NIRS to invitro-kinetics. The second phase of this project was to develop an NIRS calibration equation that can predict digestion kinetics of forages. Beyer-Neumann (1998) found that it was possible to develop a NIRS calibration equation to predict in situ digestibility. 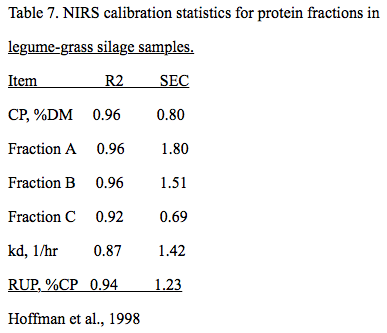 In this initial study, a NIRS calibration equation was developed with 30 forage samples. NIRS predictions of the rate and extent of forage digestion were as accurate and precise as predictions of the CP, NDF, and ADF content of the forages. The number of samples used in this study was not large enough to develop a commercially viable equation, but this preliminary experiment demonstrated that digestion kinetics of the forage can be predicted by NIRS. 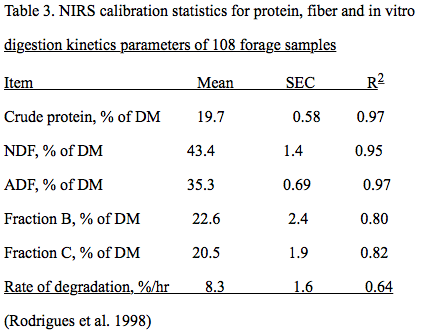 Rodrigues (1998) then calibrated the NIRS to predict in vitro digestibility of forages. The goal of this experiment was to develop a database that could serve as the basis for developing a NIRS calibration equation that can be adapted to commercial testing laboratories. Forage samples (n=182) submitted to commercial testing labs for routine analysis were collected. The samples were pre-scanned with an NIRS instrument and 108 samples that were spectrally different from one another were selected. Each sample was analyzed for CP, NDF, ADF, lignin, fat, and ash. Fiber digestibility was then determined by an in vitro procedure on each sample. Dry matter digestibility, the fractions of digestible and indigestible fiber and the rae of fiber digestion were the determined from the in vitro assay. NIRS calibrations were then developed to predict the CP, NDF, ADF and digestion kinetic parameters of the forages. The NIRS calibration statistics are summarized in Table 3. The mean concentrations of CP, NDF and ADF of the sample indicate that the database generally represents high quality forages. The low standard errors of calibration and high R2 for the calibration equations that predict CP, NDF and ADF indicate that these forage components can be predicted with a high degree of accuracy and precision. The calibration statistics are similar to calibration statistics for NIRS equations currently used by commercial testing labs. The higher SEC and lower R2 for the digestion kinetics parameters indicate that these components are predicted with less accuracy and precision than CP, NDF or ADF. The calibration statistics for in vitro digestibility are still acceptable however. The database is still quite small relative to the databases used by commercial labs predict CP and fiber. It is likely that as more samples are added to our database, the calibration statistics for digestion kinetic parameters will improve. Summarized in Table 4 are calibration statistics for directly predicting forage digestibility by empirical, summative and in vitro-kinetic approaches. These data suggest that the summative and in vitro-kinetic methods for predicting forage digestibility are adaptable to NIRS analysis and the results will be predicted with nearly the same accuracy and precision as measurements of fiber and protein. Validation. The third phase of this project has been to confirm that the estimates of forage digestibility derived from the NIRS-in vitro kinetics approach truly reflect in vivo digestibility. An experiment was conducted with 12 lactating dairy cows to evaluate the in vivo digestibility of three alfalfa hays. The in vivo digestibility of the hays was then used to validate alternative systems that indirectly predict forage digestibility. Digestibility coefficients for hays were estimated by an empirical method (Rohwedr et al 1978), a summative method (Weis et al., 1994) and by the in vitro-NIRS method developed in our lab (Rodrigues, 1998). The feeding trial measured production, feed intake, rumen environment, rate of passage, and digestibility in cows fed diets containing one of three alfalfa hays. The hays used in this study were selected based on their ADF content and the digestibility predicted from the empirical and in-vitro NIRS methods. The compositions of the hays are summarized in Table 5. Hay L-ADF1 and L-ADF2 were similar when calculated by the empirical method (63.8%) or analyzed by the in vitro NIR procedure (63.8%). 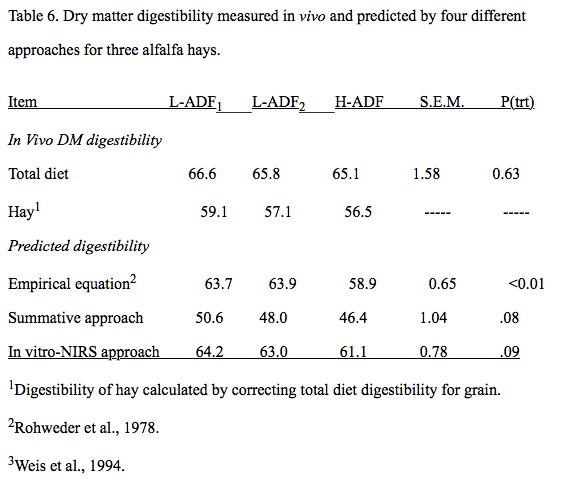 Hay H-ADF was approximately 6 units higher in ADF than the other two forages and as a result the empirical regression would suggest that it would be approximately 5 units lower in digestibility (58.9%) than the other two hays. The result of the in vitro-NIRS procedure, however, suggest that this hay was similar in digestibility to the other two hays. Results of the feeding trial suggested that digestibility predicted by the in vitro NIR approach and the summative approach were similar to the digestibility observed in vivo (Table 6). In the context of this study, the empirical approach was less accurate than the summative and in vitro NIR approaches. Legume and legume-grass silages often supply the majority of CP, ruminally degraded protein (RDP) and ruminally undegraded protein (RUP) in dairy cows and heifer diets. Requirements for RDP and RUP have been established (NRC, 1989), but no commercial test is available to directly estimate RDP or RUP. We have developed a NIRS procedure, based on ruminal in situ degradation of forage proteins to predict the RUP content of forages. Although results are preliminary, it appears that the RUP content of legume, grass or grass-legume mixtures of silage can be predicted by NIRS. The calibration statistics (Table 7) suggest that the kinetics parameters that are used to calculate RUP and the direct estimate of RUP by NIRS are comparable to the calibration statistics for predicted crude protein. This procedure is sensitive enough to detect differences in RUP caused by different maturities and forage moisture content at ensiling. The RUP content of 300 legume-grass forage samples were evaluated with this newly developed equation. 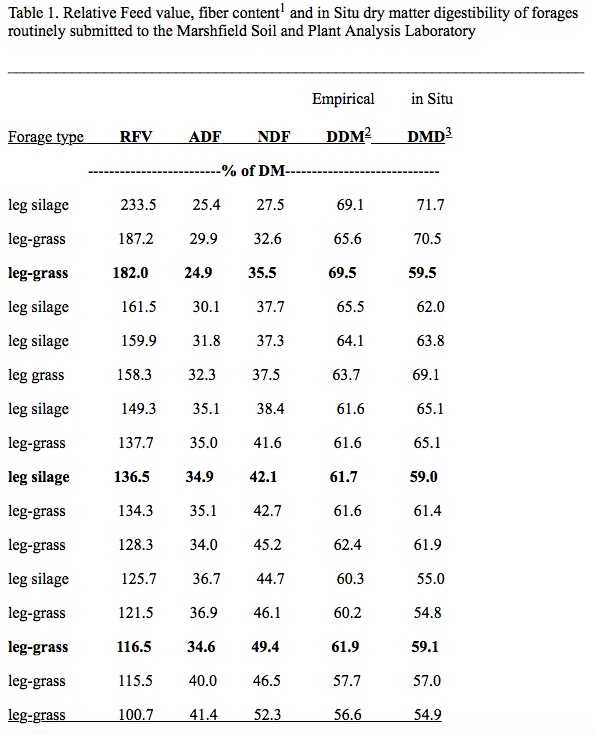 The NIRS procedure suggests that the RUP content of forages was not affected by moisture of ensiling when legume-grass silages are ensiled at less than 50% DM, but when forages contained more than 50% DM at ensiling, RUP contents of forages increased as forage DM increased. The predicted RUP content of legume-grass silages appear to be within industry norms and are consistent with known pre-established relationships between other nutrients in legume-grass silages and RUP. An NIRS prediction of forage dry matter and protein digestion kinetics would make it possible to value the energy and protein in hay more accurately than is currently possible with the RFV system. By knowing the kinetics of forage digestion, it would be possible to adjust the digestible energy of hay for animals of different levels of production and value forages according to the production level of the animal. Forage pricing formulas could also be developed that would value the digestibility energy and the bypass protein. Ration formulation software is available that predicts nutrient flows based on feed ingredient and digestion kinetics (Fox et al. 1992). The digestion kinetics of most feeds are however estimated since methods to directly measure the kinetics of digestion are too costly and slow to do on a routine basis. The proposed NIRS method would greatly facilitate the use of kinetics-based ration software. In vitro methods are currently used by most forage breeders to evaluate digestibility of new forage varieties. More emphasis is being placed today on new corn silage and alfalfa varieties that are either a) higher in digestibility at a given maturity or b) decline in digestibility more slowly over time. Most plant breeders use either relative feed value or a single time point in vitro digestibility to assess forage digestibility. Development of this NIRS technique would provide plant breeders with an alternative means of forage selection. With our approach, four distinct characteristics (A, B, C pools and Kd) of forages could be identified in forages and selection could be based on these parameters. Beyer-Neuman, E. P. 1998. Development and validation of near infrared reflectance spectroscopy equations to predict rumen digestion kinetics of forages. M. S. Thesis. Department of Dairy Science, University of Wisconsin-Madison. Fox, D. G., C. J. Sniffen, J. D. O’Connor, J. B. Russell and P. J. Van Soest. 1992. A net carbohydrate and protein system for evaluating cattle diets: III. Cattle requirements and diet adequacy. J. Anim. Sci. 70:3578-3598. Mertens, D. R. 1993. Rate and Extent of Digestion. Page 13 in Quantitative Aspects of Ruminant Digestion and Metabolism. Edited by Forbes, J. M. and France, J. National Research Council. 1989. Nutrient requirements of dairy cattle. Natl. Acad. Sci., Washington, DC. Rodrigues, M. T. 1998. Estimating available energy of mixed forages by near infrared spectroscopy using three predicting approaches. Ph. D.. Thesis. Department of Dairy Science. University of Wisconsin-Madison. Rohweder, D. A., R. F. Barnes and N. A. Jorgensen. 1978. Proposed hay grading standards based on laboratory analyses for evaluating quality. J. Anim. Sci. 47:747-759. Weis, W. P. 1994. Estimation of digestibility of forage by laboratory methods in Forage Quality Evaluation and Utilization. G. C. Fahey, Jr. Ed. American Soc. Agronomy, Madison, WI. Weis, W. P. 1998. Symposium: energy availability. Estimating available energy content of feeds for dairy cattle. J. Dairy Sci. 81:830. Redesigning alfalfa: Can we reduce protein loss in alfalfa by introducing traits from red clover? Alfalfa (Medicago sativa L.) is often referred to as the “Queen of Forages” due to its relatively good digestibility, high protein, and ability to readily fix nitrogen. As a result of fixing nitrogen, the protein produced by alfalfa should have a high economic return in dairy systems because minimal outside inputs are required to produce it (i.e., no expensive nitrogen-based fertilizers).